Madagascar has many hoops to jump through in terms of logistics, and with so much to see, taking a good guide and driver will not only get everything you want to see in, but add to your experience. Remote River Expeditions - Madagascar, based at the Chez Maggie Hotel in Morondava, organized our whole 25 day tour of the Island. Even organizing beforehand via email Gary was timely on hand to tailor the trip and organize everything including internal flights. After arrival we spent most of the tour with our English speaking guide Ludo and driver Keckin who were exemplary in terms of knowledge, service and company. We managed to see deep into Malagasy life, varying landscape, flora and fauna all with the best local guides at each turn. Additionally our 4x4 car was in great condition, which is also an important consideration taking on the Malagasy roads. In short the trip was custom made to our design with every detail taken great care of by Remote Rivers. I can't imagine there is a better way to explore Madagascar for the first time. 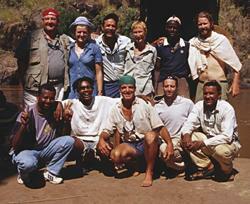 I highly recommend Remote River Expeditions if you're looking for a bit of adventure while you're in Madagascar. They planned a bespoke canoeing and camping trip for us which was incredible - extremely well planned, with a fantastic team led by the wonderful Ludo. Everything was provided, from tents and sleeping bags to delicious meals cooked for us over the camp fire each night. We will never forget our wonderful week thanks to Gary, and the team at RRE and Chez Maggie Hotel where we stayed for a couple of nights at the end of a tour with Remote River Expeditions. The Chez Maggie is a fantastic hotel. Gorgeous bungalows scattered round beautiful gardens. Direct access onto the beach, and a wonderful spot to watch sunset with a cold beer. The restaurant is great, and the service from Gary, Baholy and the whole team is exemplary. We had an extremely chilled few days there, enjoying all the little luxuries after a camping and canoeing trip. We would like to thank you and your people for the remarkable trip you organized for us in Madagascar. We enjoyed it tremendously. Everything went smoothly due to the correct planning combined with the devotion and skillfulness of the guides and drivers. Many Thanks for the chance you gave us to see this beautiful country and its people. RRE really did us proud throughout a 20 day trip and I would have no hesitation in recommending them to anybody who wants a tour arranged in Madagascar, or a beach stay at their Hotel, Chez Maggie, in Morondava on the west coast. Seemingly simple things can be complicated in Madagascar. Ludo, our English speaking Malagasy guide ... rolled out the red carpet in front of us and was ensuring that it was rolled up tidily behind us too! This really made the holiday, allowing us to relax and enjoy Ludo's deep knowledge of the local wildlife and flora. Choosing an outfitter for a personal itinerary is difficult ... we looked at information on a number of organizations, eventually corresponding with 4 that we found. 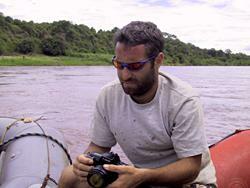 Our final choice was Remote Rivers Expeditions. What made RRE stand out when corresponding was that all their responses were tailored to our specific needs. Importantly, they were also confident enough to advise about the best choices to make. By exchanging emails it was possible to get some idea of the competence of the outfitter. RRE was willing to supply a rough cost per day per person early in the discussions so we had something to work with as we planned the details of the trip with him. Gary Lemmer and his wife Baholy are locals and run RRE from their base at their hotel Chez Maggie in Morondava. They delivered all that we could reasonably ask for, and more, for a fair price. We were happy with the quality of the choices they made and the cars they supplied. We could not ask for better service. Well done! 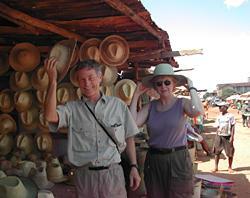 I initially found it difficult to find reliable information on tour companies in Madagascar. I was planning a trip for myself and 2 friends and was lucky to stumble upon "Remote River Expeditions - Madagascar" who seemed to have everything we needed. We had a wonderful 18 days in Madagascar and would dearly love to go back. We also had a couple of days of very rough 4x4 driving to get to Akavandra on the Manambolo River. If you chose not to do the 4x4 drive Gary will arrange for you to fly in. 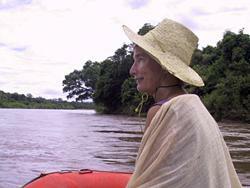 From Akavandra we began our adventure paddling down the Manambolo River (very still waters-no rapids). Ludo and his crew really looked after us during this time pitching tents and preparing and serving the most wonderful food in very remote conditions. To conclude our journey we had several relaxing days at Morondava staying at the Chez Maggie Hotel where Gary and his wife Baholy live and operate both the hotel and Remote Rivers Expeditions - Madagascar. It is right on the beach of the Mozambique Channel and truly the most beautiful place to stay. All in all a fabulous experience and holiday where we always felt safe and I would recommend this to anyone who wants a true adventure. We had such an incredible time in Madagascar. I find myself almost speechless trying to explain to friends all our experiences and the sights we saw. The highlight was the trip on the river, the people and, of course, the lemurs. I am in awe at the quality and variety of food which you and your crew prepared over tiny campfires. Here, in the US, it seems that no one (except those in our team) can go camping without a 30+ ft. camper complete with stoves, ovens, microwaves, TVs etc. I will always have a special spot in my heart for Madagascar. The nights at Chez Maggie were a perfect way to ease back into life with showers, etc. You and Baholy have a wonderful, peaceful location - with a great kitchen. Gary, thank you so much for the experience of a lifetime. With deep respect for your skills on the river. Well done. Best regards to Baholy and thanks to her as well for such a delightful stay at Chez Maggie. ... to let you know how much we enjoyed our stay in Madagascar. In particular, we want to thank you for organizing the trip on the Mangoky river. We loved every minute of it. The expedition food was the best we have ever eaten, and we enjoyed your company and that of your hard working crew. You have been able to gather a great team together, and of course, as you know, Ludo is simply a gem. While the river was in many ways the highlight (we are still drooling over some of those magnificent misty sunrises); we loved our time at Chez Maggie (more great meals including the magnificent final feast), and were enthralled by the lemurs we saw at Andasibe and Kirindy, and on the river too. Ludo, with his great knowledge of the flora and fauna added so much to our experience on our walks in the reserves, and we simply enjoyed being in his company. We also found the last days in Mondorava, with a visit to the local fishing village, to be very worthwhile. Even Lemur Island, touristy though it was, allowed us extremely close contact with lemurs, creatures we fell in love with. We trust all is well with you and your family, that Chez Maggie and Remote Rivers are busy and prosperous, and hope that some day we may all meet again in beautiful Madagascar . Our trip was one of a lifetime! Thanks to you, Bruce, and of course Ludo, along with our driver Mr. Pierrot, who got us to our destinations safely. I think the highlight of the trip for me was when we went into a small school (can't remember where) and I taught the children a song that I had taught my 4yr olds at home. The teacher was delightful and the children were precious . . . they seemed to love the little song. I began to see that I could possibly teach young children abroad - what a vision. . . don't know how or when or where, but it is a possibility. I think you should do more to promote the gem and jewelry industry in your beautiful country. Many beautiful gems come from Madagascar - lots of different colored sapphires, not just the deep blue ones. Like I said, I love gems and I know there are others who like them as much as I do. Just a thought from someone who loves her Malagasy jewelry. Thanks for all you did to make our trip memorable. We had a great time! I'm back in london feeling like my extraordinary trip on the Omo was a big dream. 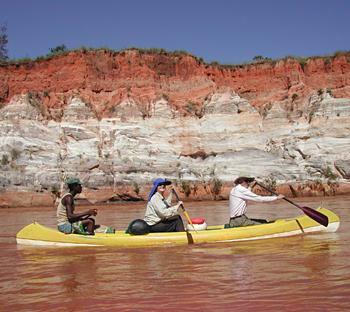 Its hard to believe it was only two weeks ago that I was travelling down the Omo river. It was an amazing experience and it was made by the great people I travelled with. So thank you to all who made it such a positive and happy experience, a once in a lifetime experience. I have taken so much from the trip, no only aesthetically but personally, building bonds with people and new friends. I will forever the stunning gorges and canyons that we rafted through in silence, as our minds were being swept away by their beauty and tranquillity. Rafting past families of hippos (big fat scaredy cats!! ), baboons and colobus swinging in the trees, the most spectacular birds soaring in the clear blue skies. Seeing the excitement of the village people who came to see us. Our mutual excitement of seeing each other, simply beaming with happiness, their donkeys waiting by the water while they swam with their goats skins in the Omo brown river. I thrived on the anticipation of what each day brought. We were woken by the rising sun and went to bed with the sun setting. The magical camp sites we used were simply dreamy. Each morning waking up peering out of my tent in awe, amazed I was even there. We were so far removed from the world we couldn't work out what day it was. The hot springs, the outstanding waterfalls, the water slide, the great conversations the list goes on. Smelling the wood burning on the campfire for breakfast and dinner, eating great food and drinking the ultimate cup of tea on the the river bank after a day on the water was simply perfect. 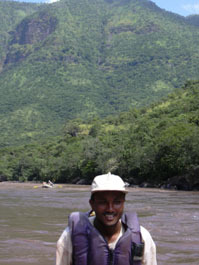 "I can only repeat what I said during my movie interview � It was a tremendous privilege and experience for Myles and I to be rafting on the Gibe/Omo River with Gary and his team of such experienced, professional oarsmen. Despite the remoteness of the river from civilization, and the closeness of the crocs and hippos, at no time did we feel concerned for our safety. We saw the river from an entirely different point of view, being carried ON it - and learned that it is a beautiful, living, changing being, revealing secrets slowly and often surprisingly. The camping, while sometimes difficult in the dark and rain, was also fun, with excellent food and a camaraderie among all. Many thanks for teaching us so much about something we so often take for granted - rivers - and about which we knew so little." "After our first river trip with Remote River Expeditions on the Tsiribihina River it was just a question of time when to do the next trip in Madagascar with RRE. So we did it in 2004 and really had a nice time in Madasgacar again and especially on the Mangoky River. We enjoyed romantic camps on remote sand bars, delicious food, nice company, many animals, nice trekking tours (especially Isalo was fabulous), music at the campfire and after all some relaxing days on the beaches of Madagascar's west coast in Ifaty. 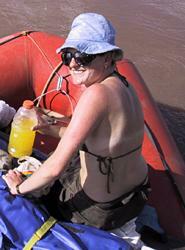 Thanks to the team of Remote River Expeditions for their great guidance and organisation." 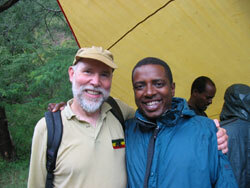 "Rafting on the Upper Omo River, 15-days was (is) the loveliest and biggest chapter in my life. When I first thought about it I was not so sure what it would be a like in reality. By the continued effort and encouragement of the Remote River Expeditions officials (especially Gary Lemmer) I now have something to talk about the rest of my life. What can be more enjoyable than to find yourself in the middle of nowhere being happy, breathing the cleanest oxygen, appreciating uncountable sceneries which change every 100 yds, and looking at clearest sky at night. And exchanging ideas with persons of different ages, nationalities, life experiences and angle of view. I knew that the country is naturally rich; I proved it and it made me prouder of my country. Besides of all naturally available things on the trip I greatly enjoyed the accommodation by Remote Rivers, it was just awesome." "I have been on a lot of fantastic white water trips, and row myself, but the Omo River with Gary and Alyson was truly phenomenal. Gary is laid back in everything but his regard for his client's safety and enjoyment. An expedition like the Omo never goes according to "plan" (hippos and monsoons fail to cooperate), but Gary is a wizard at innovation and getting the most out of any trip. Be sure to grab the opportunity to join Gary on his next river expedition." "Gary worked patiently with us for over two years planning an itinerary for ten friends who wanted to 'see it all and do it all' in only three weeks and within a reasonable budget! Although it would be impossible to do justice to such a varied and fascinating country as Madagascar in such a short time we certainly gave it a try! Along the way we canoed, trekked, rode zebu carts and a unimog before a brief sojourn at the coast for diving, snorkeling and just plain relaxing on the Mozambique Channel at the beautiful Chez Maggie Hotel. In all we traveled through four very different ecological regions and the homelands of nine tribal groups, for the most part maintaining the "mora mora" philosophy. This relaxed composure was largely because of the efficiency and flexibility of Gary and his team as well as the welcoming, easy going nature of the Malagasy people. Nowhere in our far ranging travels have we felt more at ease than among the Malagasy. Gary's assistant Gerard Ravoajanahary is a professional naturalist of the highest order and has an uncanny ability to spot wildlife, large and small , during the heat of the day or at night. 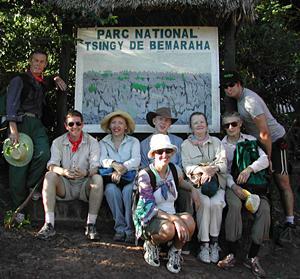 No one in our group felt they had not seen a broad sampling of Madagascar's unique fauna and flora. Thanks for a unique experience." "What a rich experience! Spectacular scenery, varied terrain, fascinating creatures, exotic trees & plants, wonderful food accompanied by Malagasy music around the campfire, and the tender care of our river guides and porters. Gary and Gerard's warm professionalism made our visit extremely memorable. Each part of our journey was well thought out, and went very smoothly. And Chez Maggie Hotel in Morondava is a must!" "My Omo trip was an incredible adventure into a wilderness with animals that kept reminding me I was in Africa and peoples with cultures so vastly different that I know I will never look at our society the same again. After the initial anxiety, the daily routines of camping and being on the water and sharing good meals and good company eased any fears I had. The rafting allowed much time for contemplation of the passing scenery and of tse tse flies and of my own place in the world - a chance for an inward journey as well as one to a distant land." "Best two weeks of my life!" 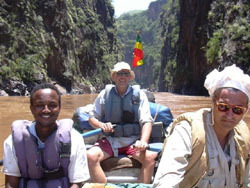 "Rafting the Omo River presents an amazing opportunity to leave the familiar behind. It was truly a life changing and soul clearing adventure. Never before (and never again) will I see and met people so far removed from our increasingly small world. Crocs, hippos, baboons, amazing scenery, secluded camps and the people, the encounters with people along the river were the best of all. They were as fascinated by meeting me as I was by meeting them. I have stories to last a lifetime."